Phillies Contest Winner, Donald J. Smith! Yesterday afternoon, Rob, Digital Marketing Manager at SERVPRO of Pennypack/Bustleton, met with Donald J. Smith, the winner of our Philadelphia Phillies Ticket Giveaway. Donald won five tickets for this Saturday’s game against the Marlins, and will be taking his great nephew to his first ever Phillies game! We asked Donald to come prepared for a few pictures, and he showed up like a true, Phillies fan should — decked out in Phillies gear! We hope Donald and his family have a great time at the game and would like to thank all of those who have participated in this contest! On Saturday, May 11th from 10am to 12pm, Richland Township Fire and Rescue is hosting a Stop the Bleed event which is FREE with registration. The training, food and light beverages will all be provided! The training will be provided by Focus! Safety Training, who will teach the class techniques that will ultimately help save lives. All of which focus on stopping a person from bleeding, like correctly applying a tourniquet to their wound! SERVPRO of Pennypack/Bustleton will be sponsoring this event, providing barbecue for all those who attend. Stop the Bleed is a national awareness campaign that is designed to train people how to save lives in emergency situations that involve critical blood loss. April is National Volunteer month, recognizing the efforts of thousands of people who intend to positively impact an important cause. Here, at SERVPRO of Pennypack/Bustleton, we strive to practice many forms of community service and are continuously humbled by the remarkable events we are able to help out with. On Saturday, April 13th, Sean McCabe, co-owner of SERVPRO of Pennypack/Bustleton, volunteered with The Red Cross on MCCC Pottstown’s Campus. Sean aided The Red Cross in pursuing students to volunteer and to spread awareness of opportunities in the area where they can lend a helping hand. Thanks to Sean and The Red Cross, many students were able to learn about the importance of volunteering and the positive impact it has in our communities! If you are interested in volunteering, please visit https://www.redcross.org/volun…/volunteer-opportunities.html to find out how you can volunteer and make a difference! SERVPRO of Pennypack/Bustleton is always ready to load up and respond to any emergency situation. Today, we responded to a large, commercial fire site in Philadelphia, where our experienced technicians began to restore the property to its original state. From the moment we become aware of a loss, down to the completion of the job, our staff is locked in every step of the way. It is during the morning briefs, the preparation of equipment, the drive to the loss, and to the arrival on site where our crew focuses on the tasks at hand to deliver quality, efficient restoration work. So as we tackle this large loss today, and as we are ready do so in the future, SERVPRO of Pennypack/Bustleton is committed to providing superior service — in every aspect of the job — GUARANTEED! One Week Away from Phillies Giveaway Winner! There is one week left to enter in our contest! 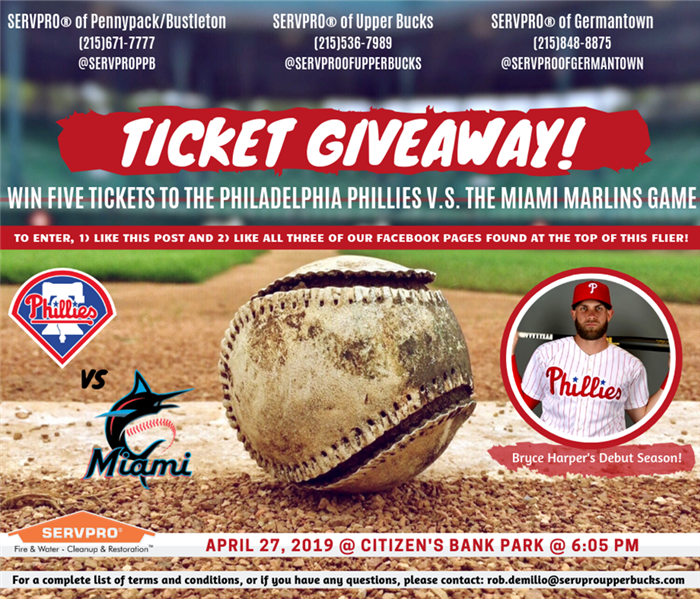 WIN Five (5) tickets to see The Phillies take on The Miami Marlins on Saturday, April 27, 2019!!! Please visit our Facebook pages for more information about this contest! We urge you to enter if you haven't yet! ** No Purchase Necessary to Enter or Win. ** This promotion/giveaway is in NO WAY sponsored, endorsed or administered by or associated with Facebook, The Philadelphia Phillies, The Miami Marlins and/or by Citizen’s Bank Park or any of its affiliates. ** Disclaimer: We do not own the rights to the images used in this flyer. The images used belong to their respective copyright holders. We would like to thank all of those who have been participating in our Facebook contests, hopefully having a great time doing so, too. In order for us to continue offering giveaways that appeal to everyone, we want YOU to tell us some giveaways you want to see in the future! Our Instagram pages will be launching polls on their Stories, in hopes of gaining insight from the public, as to what types of prizes they might want to be included in upcoming contests. Make sure you FOLLOW OUR ACCOUNTS to participate in these polls! These polls will give us the opportunity to see what kind of prizes you’d like to win! There is NO WRONG ANSWER! Each response will be recorded, but common/reoccurring suggestions will be placed into consideration for future contests! We will be keeping an eye on our polls and can’t wait to see what you all come up with! Thank you!!! 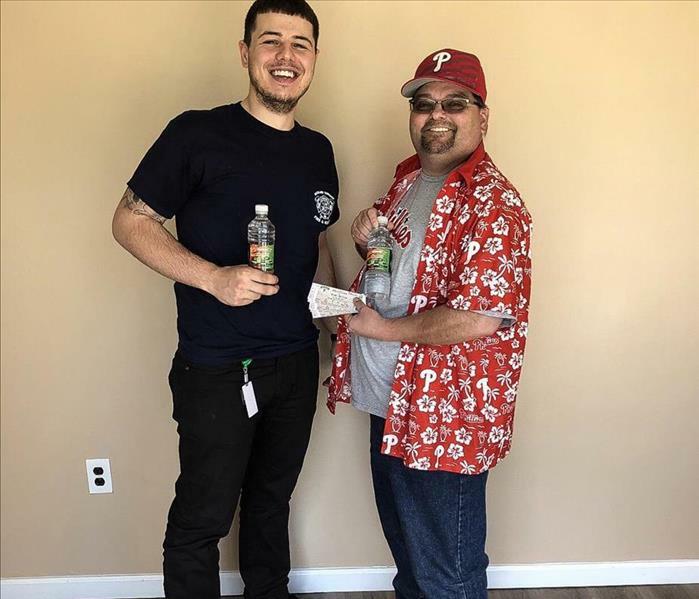 - Content by Rob D'Emilio Jr.
At SERVPRO of Pennypack/Bustleton, we are committed to excelling all of your expectations with our restoration services, striving to leave your properties cleaner than we left them. To help aid this goal, we’ve been implementing brand new, Kett KSV-432 Vacuum Saws on jobsites. The cast, aluminum heads of these vacuum saws accepts your shop vacs, which controls the vast amounts of dust and debris that spreads from cutting drywall, fiberglass, plaster, and other materials. The saws are also very maneuverable, due to their lightweight design, making them the ideal tool for cutting in close quarters. SERVPRO strives to perform the necessary tasks to leave your properties in a better condition before we hand you back the keys; if you need demolition work or any restoration services, give your local, SERVPRO franchise a call TODAY! - Content by Rob D’Emilio Jr. AFFECTED AREAS: The Poconos, the Lehigh Valley, Berks County and Southeastern Pennsylvania. Also, Northwestern, Central and Southern New Jersey, as well as the entire state of Delaware. From 10:00am until 9:00pm, Wednesday, April 3. Winds: West 20 to 25mph with gusts of 30 to 35mph. Impacts: Gusty winds and very dry air will create conditions that may promote the rapid spread of wildfires. Like any other weather warning, instances such as these should be taken seriously and should be cause for concern, which warrants sufficient preparation to avoid and/or limit potential damages. For more information about wildfire danger, burn restrictions, and wildfire prevention and education, please visit your state forestry or environmental protection website. No matter the weather or what nature throws your way, SERVPRO has your back! -Content by Rob D'Emilio Jr.
Every year, over 25,000 house fires can be attributed to the incorrect usage of space heaters, according to Consumer Reports. Fighting the cold weather using these machines can be safe — referring to NFPA’s (National Fire Protection Association) “Heater Checklist” will guide you into making the correct decisions to ensure a safe home/environment for your space heater to do its work. When buying a space heater, make sure that the unit has a seal from a qualified testing laboratory on it. Keeping children away from these heaters will limit bodily injury and poor usage of the units. Make sure the unit is placed on a solid, flat surface. Allow at least 3 feet of space between the space heater and anything else, including humans. Items that tend to catch fire are: curtains, bedding or upholstered furniture. Turn off the units when you leave the room or before you go to bed. If your property has been damaged due to a fire and you suspect that your space heater was the cause, call your local SERVPRO franchise for all of your restoration needs. -Content by Rob D’Emilio Jr.
Gamma irradiation is a process used for cleaning/disinfecting and decontaminating documents or other consumer goods. In gamma irradiation, high-energy photons are emitted from an isotope source producing ionization throughout a product. In a CAT 3 situation (sewage or flood water), documents are not only deteriorating but are also infected with all types of bacteria. In most storm situations, you are dealing with CAT 3 water; therefore, most of the affected documents that you will encounter these disruptions result in damage to the DNA and other cellular structures, These photon-induced changes at the molecular level cause the death of the organism or render the organism incapable of reproduction. The gamma process does not create residuals or impart radioactivity in processed products. SERVPRO is always ready to help restore your documents and would be more than willing to assist you in any way that we can — give your local franchise a call for all of your restoration needs! 4/25/2019 - Phillies Contest Winner, Donald J. Smith! 4/17/2019 - FREE Stop the Bleed Event! 4/12/2019 - One Week Away from Phillies Giveaway Winner!